For those in the US, who celebrate the date, have a wonderful day! I wish I had a lot of cooking to share with you, but we will be pampered guests this year again. I heard our boss’ daughter will be bringing her signature butternut squash soup to the get-together, and his wife will make her family’s turkey recipe and the usual side dishes. Can hardly wait! 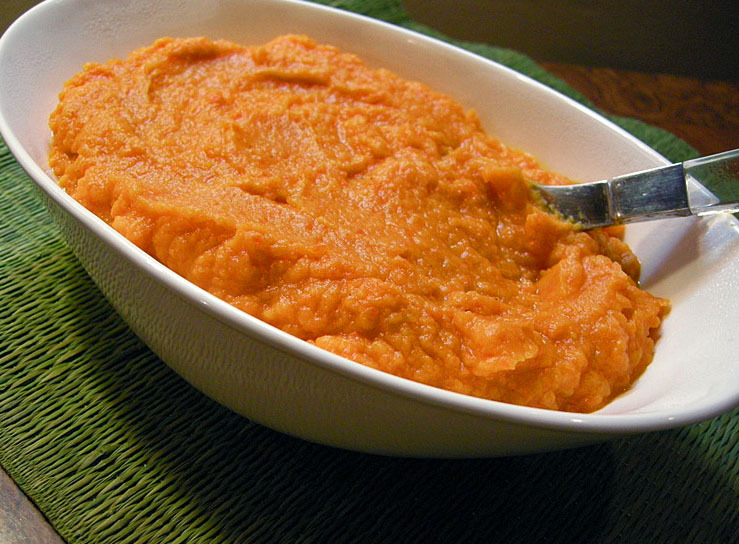 If they had allowed us to bring something to the meal, I’d probably make this delicious sweet potato and carrot puree, so I leave you with a little flash-back from a previous post in the Bewitching Kitchen. Happy Thanksgiving to you and Phil, Sally! You couldn’t bring anything? Oh no. Well maybe take some bread as a gift, I’m terrible I know. Have a great Thanksgiving. Happy thanksgiving for you, too! I hope you had a fabulous Thanksgiving, chica! This puree does look awesome…two of my favorite orange veggies in one! Hope you enjoyed a very happy Thanksgiving! I’m just getting caught up on my blog reading! This puree sounds delicious and not only for Thanksgiving but all thru the holidays!